Conditions haven't been ideal over the past week or so here in Dodford with overnight temperatures struggling to start in double figures and quickly dropping as the nights have been mainly clear. The bright moon and fresh winds from the north also haven't helped. I have been putting 4 traps around the garden on the nights I have trapped and numbers have been low but most nights have usually produced a few species new for the year and most things appear to be quite early. 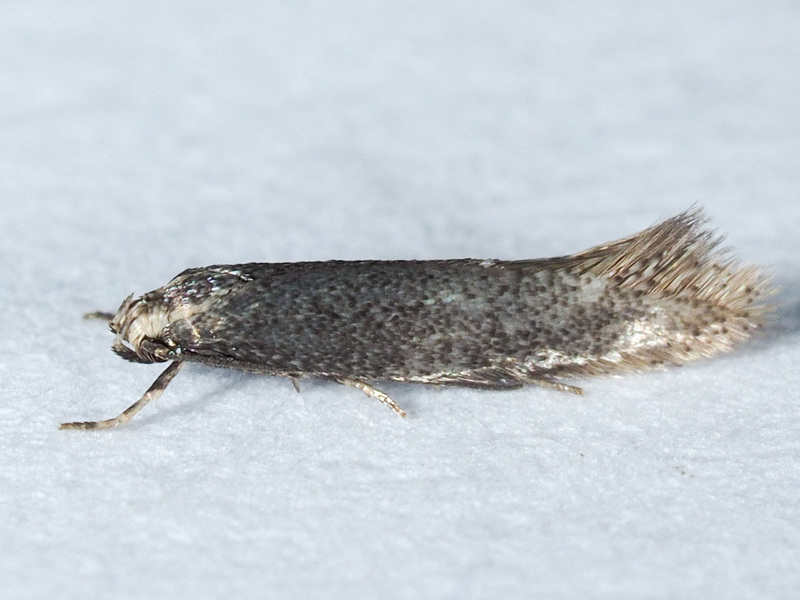 Not many micros yet but last night did manage to trap Grapholita jungiella which is new to me. Attracted to a 3w UV LED. 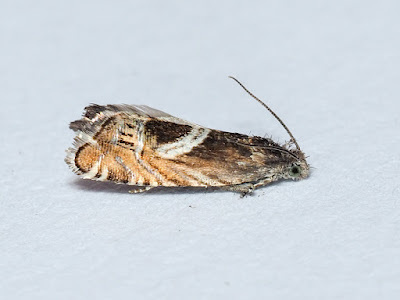 Also trapped this rather nondescript looking micro which did not want to be photographed and it is a poor photo but does anyone have a suggestion as to ID. The best I can come up with is Elachista canapennella? It was about 5mm long. That looks good for canapennella. Despite the chilly nights, I'm getting this moth in the trap also at the moment. Last night it went down to 4 by 11pm and was pretty useless in the end with only a Herald as NFY. Very static for me again after a few NFY's last week I'm back to the usual 3... Brindled Beauty, Hebrew Character and Early Grey. I have acquired an LED bulb set up but only given it limited use. I think I need to add it into the mix a bit more to see if I can shake things up a bit ! I've only used the LED a few times so too early to judge but it does seem to attract Geometrids. Streamer, Shoulder Stripe, Early Tooth Stripe and pugs.I have also had the usual orthosia in small numbers. Of course there is no telling what an Actinic or MV would have attracted. I'm also unsure what "reach" it has compared with other bulbs. Visibly they are quite dim but who knows what the moths see. Any Clothes with holes in out there?